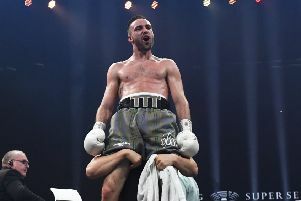 Josh Taylor is the new WBC Silver super lightweight champion after stopping Ohara Davies in the seventh round in their grudge bout at a raucous Braehead Arena last night. Edinburgh’s Taylor also retained his Commonwealth belt in what was his tenth win of his professional career. Much had been made in the run-up to the duel that had been billed ‘Bad Blood’ due to the persistent name-calling over social media these past few months. But, when the talking stopped, it was Taylor who was the far more productive throughout and the 26-year-old got the stoppage from referee Howard Foster in the seventh round in what is the biggest victory of his short professional career.